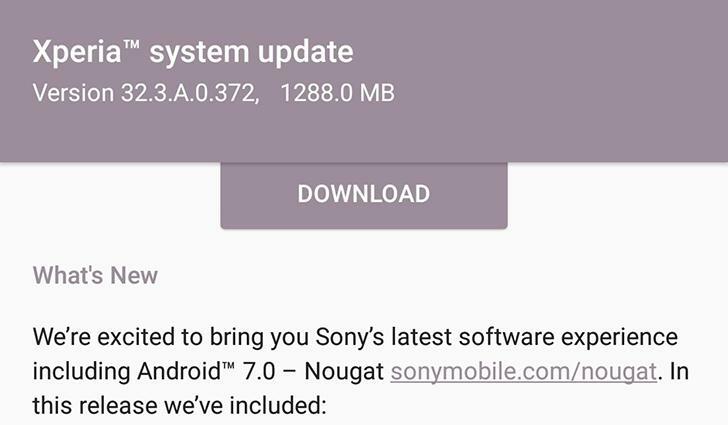 Sony's Android 7.0 Nougat promises a lot of improvements including longer battery life, a new Xperia launcher with integrated Google Now pane, a self-timer button for the front camera, multi-window support, and all of Nougat's new features. If your phone hasn't received the OTA notice yet, check manually and be patient. These things take a while to reach everyone. According to Xperia Blog, the Android 7.0 Nougat update OTA has also started rolling out to the Xperia Z3+ and Z3+ Dual. It has the same firmware number 32.3.A.0.372 and weighs a little more at 1347MB. Sony is ON! The company just announced on Twitter that the Nougat update is rolling to the Xperia Z4 Tablet (and the Z5 and Z3+ series). This is some really awesome work from Sony, where other companies are still struggling to even roll the update to their most recent flagship. Sony has halted the rollout of the Nougat 7.0 OTA to all the devices mentioned above. In a statement to Xperia Blog, the company said that it has received reports of "inconsistencies related to audio playback via third-party apps and SD card encrypted data read performance" and it has identified the cause. It is now working on fixing the bug and resuming the OTA with the updated and fixed firmware. The saga continues. 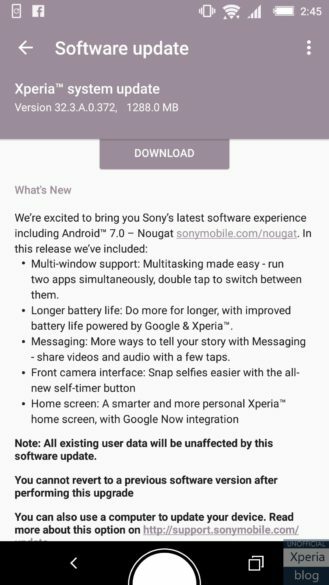 After being halted for the past couple of weeks due to several bugs including audio playback from 3rd-party apps, the Nougat OTA is now resuming its rollout for all the Sony devices mentioned above: Xperia Z5 family, Z3+ family, and Z4 Tablet. There's a new build number though, 32.3.A.0.376, which fixes the bugs.